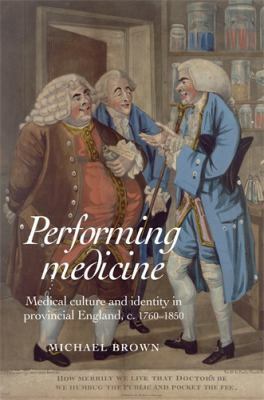 Performing Medicine; Medical Culture and Identity in Provincial England, c.1760-1850 (Manchester & New York: Manchester University Press, 2011), 254pp. I get excited when I receive a new book that so wonderfully engages with some of the major themes covered in my dissertation, and even better, a book that nicely contextualizes the background upon which I will narrate my story of aural surgery. I’ve long been a fan of Michael Brown’s works, particularly his paper “Medicine, Quackery and the Free Market: The ‘War’ against Morison’s Pills and the Construction of the Medical Profession, c.1830-c.1850,” published in Mark Jenner and Patrick Wallis’ Medicine and the Market in England and its Colonies, c.1450-1850 (New York: Palgrave MacMillian, 2007). Jenner and Wallis’ anthology sought to undertake a critical examination of the term “medical marketplace” and unpack its various ambiguous meanings. Broadly focusing on the nature of the medical provision and its economic, institutional, cultural and political contexts, this work presents a series of essays that evaluate the scale, scope, and boundaries of the internal dynamics of the market for medicine. Some of the key questions addressed are: what emergences in the medical marketplace? Is the term “medical marketplace” in due of a revision, as Margaret Pelling has argued? Is medicine to be viewed as a market or an economy of health care (and is there a difference)? How do we use a model of the marketplace to historicize and analyze the structure of therapeutic practice and its complex internal and external dynamics? Should historians shift their thinking from an abstract and generalized concept as “medical marketplace” towards a more focused concept of medical goods and services? Brown’s chapter in that anthology makes the point that while the 18th century has been characterized by a fluidity and plurality of knowledge and practice as well as a cultural of commercial individualism, the 19th century rather saw a hardening of boundaries and the elaboration of more antagonistic cultures within health care. Brown accounts for this shift by building upon Roy Porter’s explanation of the two factors governing the 19th century: the emergence of medical professionalization and medical reform. Within this historiographical context, he sets out to explore the mechanisms of the transformation of the mid-19th century English medical marketplace and evaluate how the anti-quackery campaigns of the 1830s and 1840s sought to radically restructure the commercial states of medicine and its relationship to the public; he does so by examining the (ideological) “war” against Morison’s Pills, which was a part of a wider attempt to establish the social, legal, and intellectual authority of “orthodox” medicine. He also emphasizes in this paper that the movement for medical reform is essential for understanding the changing perceptions of “quackery” within the 19th century. Performing Medicine extends this discussion backwards to late-eighteenth century medical culture, “to examine the ways in which medical practitioners presented themselves to the public and how they positioned themselves within the broader social, political and intellectual landscape” (2). It’s a study of medical culture and identity, of what it meant to be a “doctor” and how this identity transformed towards the nineteenth century. Being a “doctor,” Brown suggests, is not a timeless constraint, but rather a fluid, and somewhat discontinuous identity that was defined by the identities of practitioners, their interactions with the public and new techniques for medicine and surgery—and perhaps more importantly, the identity was defined by how practitioners wanted themselves to be defined. Engaging with two dominant historiographical traditions—the “medical marketplace” model and the “professionalization” of medicine—Brown explores developments and transformations within medical culture, identity, and performance. He identifies two main characteristics of identity: the 18th century was characterized by knowledge being represented as a socially instrumental form of knowledge—the “medico-gentility,” an identity based on and shaped by values of gentility, polite sociability, and civic belonging. The 19th century, on the other hand, marked a transformation in association, in which practitioner’s individual identities as gentlemen were placed within the collective identity of the medical profession. Appointments to medical charities were highly valued for a number of reasons. If they were secured through networks of patronage then they also held the potential to extend and deepen these relationships…However, charitable appointments were also notable for the more general symbolic capital they offered…such appointments also served to counteract charges of greed and self-interest. This was especially true for physicians and surgeons who almost always provided their services for free. Though what must have been, for many, a financial sacrifice, pro bono service testified to the practitioner’s commitment to the cultural values of civic society: benevolence and social responsibility (36). even if the Reform Act did not signal the end of a radical popular politics, it brought about an irreparable split in the radical-reforming coalition which had characterized the later 1810s and 1920s. Despite the initial concerns expressed in some quarters of the liberal press, middle-class public opinion generally fell behind the Anatomy Act, or forgot about it altogether. Meanwhile, while may medical practitioners continued to talk of ‘reform,’ they did so increasingly within a broad liberal consensus. In this sense, then, the Reform Act can be said to have at least partially depoliticized medical rhetoric in provincial England…[Medical practitioners] presented their inserts as being inherently congruent with those of the ‘people’ (137). Here, Brown acknowledges how medicine also tied itself within the broader ideology of social progressivism, the belief that “improved knowledge about the natural world could contribute to, and was commensurate with, the advancement and improvement of society as a whole” (126).This allowed medical practitioners to engage within the interplay of public and private, claiming social authority to perform public roles (e.g. during the cholera epidemic of 1830s) for the benefit of social good—claiming such authority on grounds that they possessed a specific form of knowledge. Performing Medicine provides numerous case studies rich with archival materials to drive home its main thesis: the politics of medico-gentility and the ideology of politeness as evident from anecdotes from various practitioners, including Alexander Hunter, Thomas Withers, William White, Oswald Allen, and other members of the Doctors Club in York; the York Lunatic Asylum reform following the scandal over the incarnation of Jane Horsman; the character of physicians and the polite and liberal forms of learning within the Yorkshire Philosophical Society; Thomas Laycock and the cholera epidemic of 1832; the British Association for the Advancement of Science; and the case of Morison’s Pills. The book is well-written and a fascinating read into the lives of medical practitioners and the culture of medicine in eighteenth and nineteenth century York. Without a doubt, Brown’s analysis is convincing and provides a new framework for thinking about the lives of medical practitioners and their claims to authority and self-identification.